AverageBro: A $300 Pair Of Basketball Shoes? Bron Bron, Please? A $300 Pair Of Basketball Shoes? Bron Bron, Please? I'm no sneakerhead, so I find this story patently absurd. Is the basketball shoe world ready for a $300 shoe? 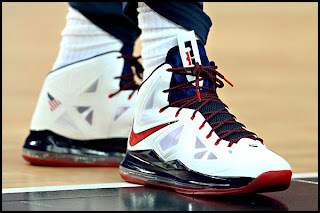 The market might get tested when the LeBron X is released later this year. The Wall Street Journal is reporting that a Nike Plus-enabled version of the shoe -- that has motion sensors in the shoe to track various metrics including how high the player jumps -- will retail for $315. Although Matt Powell, an analyst for market retail tracking firm SportsOneSource, tells ESPN that he believes the price will be $290. Despite a rough economic environment, Nike has been able to pass on the rising costs of materials to its consumers with little resistance due to the premium associated with its high-end product. Between the Nike, Jordan and Converse brands, Nike owns roughly 95 percent of the basketball shoe market in the United States. While many will be fixated on the price, Powell said it's being blown out of proportion. He estimates that Nike will make only about 50,000 pairs of the Nike Plus-enabled LeBron X's compared to 200,000 to 300,000 pairs of the regular version of the shoe, which he expects to sell in the $175 range. Part of me says $315 for a d*mn sneaker is pure lunacy. A $315 shoe cannot file your faxes for you. It cannot tutor your child in math. It cannot make mow your lawn. And it most certainly cannot improve your game (on-court), Like Mike-style. It is just a freakin' piece of overpriced leather. That said, even in a recession, people still gotta ball. It's just human nature. And if your definition of ballin' means spending $315 for a shoe (which you'll probably never actually wear outside, just talk about/twitpic) that some poor sap in the far East manufactured for $17, so be it. I'm a Washington Wizards partial season ticket holder. We all got our vices. Question: Is $315 for a pair of gym shoes just plain silly or do we all have our financial vices?! ?